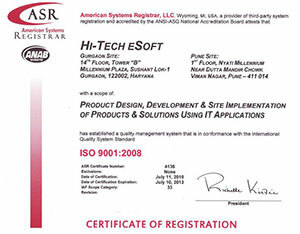 Hi-Tech eSoft has established a comprehensive System in line with ISO 9001:2008 standard requirements. The focus is always to deliver best in-class engineering services to the customer as per their requirement. At Hi-Tech, we believe that quality is a culture, expressed in the way we interact with and cater to the needs of our customers. Our quality journey began right from the inception in 1999. The quality systems have contributed significantly to our performance and growth. Detailed checklists, standards, templates and guidelines exist within the System to bring in rigor and predictability into every aspect of project planning and execution. The customers are assured that all the processes follow the management principles of an ISO organization. Our process improvement plans are prepared with inputs from organizational business directives, internal process analysis, customer feedback and industry best practices.